Zoe Gillings, Britain’s number one Snowboardcross athlete continued her seasons storming success today, Friday 22nd February, when she finished in an excellent 2nd place at the FIS World Cup Snowboardcross competition in Japan. Following her 4th place result at last weekends World Cup event in Korea, Zoe firmly had her sights set on a podium finish in her next World Cup competition. Today in Japan, Zoe made that happen when she successfully knocked out a multiple of World Class riders to take silver, moving her into 4th place in the World Cup Rankings. 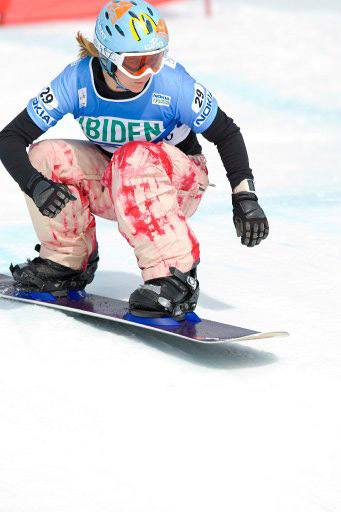 British World Cup Snowboardcross team member, James Foster also competed in Japan and finished in a respectable 44th place out of 60 competitors. Zoe Gillings will next be heading out to Lake Placid, USA on the 1st March to compete in the seventh FIS World Cup event of the season.